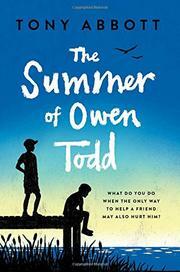 Narrator Owen Todd is 11, white, living with his parents and 5-year-old sister in a small town on Cape Cod. His father is co-owner with Owen’s uncle of a go-kart business, and his mother makes crafts and volunteers “a couple of places.” Sean Huff, Owen’s best friend from kindergarten, is also white, but he’s diabetic, shorter than Owen, and frequently sits out their baseball games on the bench, and his parents are separated. Sean’s mother has engaged a young white man from their church to “babysit” Sean while she works at a new job in Provincetown. Paul behaves oddly with Sean, failing to close the bathroom door while urinating and, later, “accidently” showing Sean a picture of a naked boy on his cellphone. Sean later reveals to Owen that Paul’s behavior has become aggressive—and includes other men. Abbott handles this escalation with care, demonstrating the ways that a predator can isolate and intimidate a victim. Sean is so wounded and terrified that he convinces Owen he will kill himself if Owen breaks his confidence. Owen acts at last, with a bit of rash courage, but the end of the story is only partly happy.